Love love this photo of Justin and Melissa at Salvatore's Italian Gardens. (ceremony was at St. Louis RC Church in downtown Buffalo.) We work at this venue a lot. It is a favorite. So, we are always thinking up new ways to make the experience different for every couple. We do not want their photos to look like anyone elses. The bride and groom had a giant head table. It was filled with all different size candles. As the lights dimmed down in the room, the glow of the candles was more prominent. The color was very warm. The blue up lights were giving off a cool colors behind them. This was going to work out amazing! Before we called Melissa and Justin in for the photo, we did a few test shots. I was the test model. We needed to see if we had to move any of the candle centerpieces around. We had to move only a few, so we could have a direct photo path to the bride and groom. The newly married couple took their seats and it was time to make something magical. Neal was shooting further away to capture more of the table. It's pretty cool how there is an out of focus vase and flower arrangement in the foreground. He moved those closer in to make the image more fun! 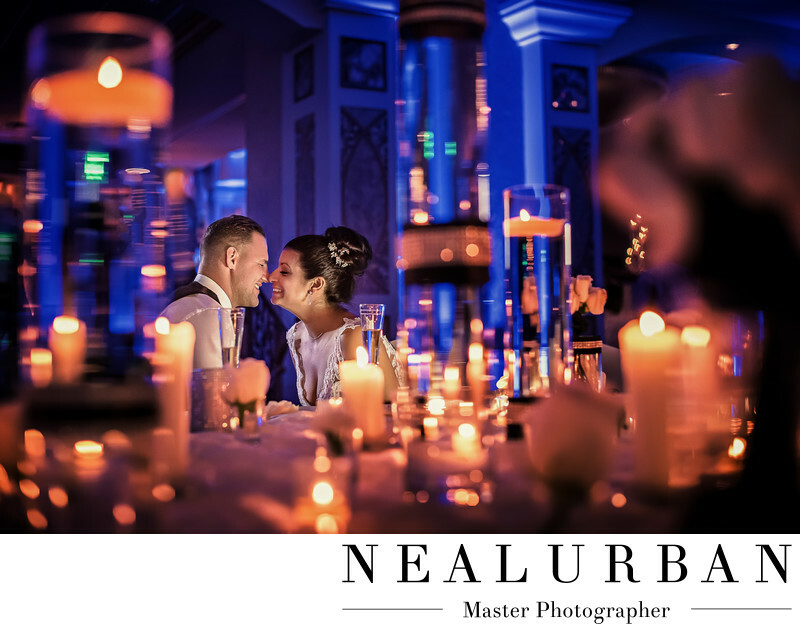 We did use some extra light on the couple's faces. We were getting some shadows from the candles. We had to fill that in. We loved how the bride and groom are glowing. This image is so amazing and we have gotten so many compliments on it. It was so different and so beautiful. Justin and Melissa are in their own world and Neal is sort of spying in on them. We wanted them be in the moment and enjoy! I think it was accomplished! Location: 6461 Transit Rd Depew NY 14043 United States.